SEBI has issued a draft paper on introduction of REITs. 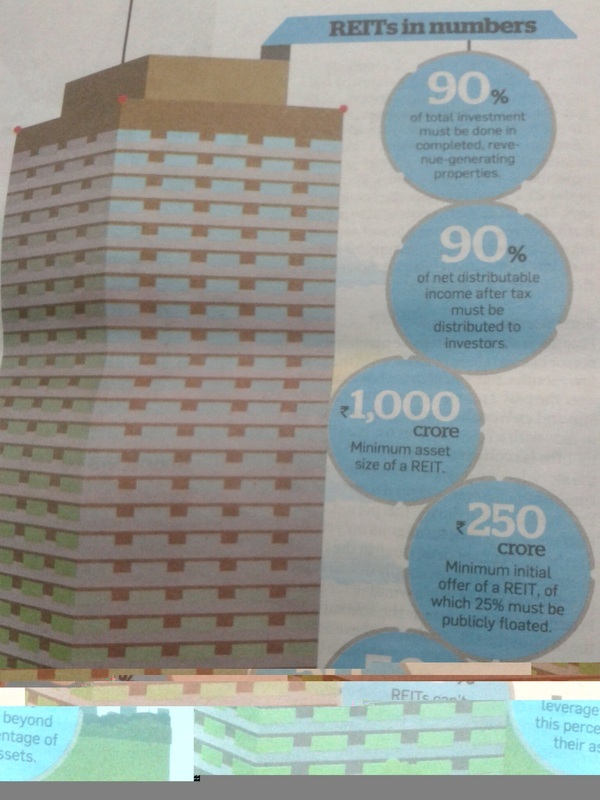 Soon final draft shall be issued and REITs will start operating in India soon. What are the advantages and disadvantages, we shall get back to it soon. Raghuram Rajan yesterday increased the repo rate to 8%. This was done in view of the CPI(Consumer Price Index) being @9.87%. Also the reverse repo rate has been brought to 7%. This means that the Home Loan rates are bound to increase. For those who are not aware of the words, repo rate is the rate at which the RBI lends money to the banks. Reverse repo rate is the rate at which bank deposit amount with RBI. This brought the market to slide suddenly. The income tax department has extended the last date of filing return for the state of gujarat to 31st Oct due to floods... How many think it should be done for the other states as well? Maintaining books and Auditing of accounts U/S 44AA AND 44AB is NOT COMPULSORY if the Assessee opts for this Presumptive Taxation Scheme. DEFINITIONS:-"Goods Carriage and Heavy Vehicles" means as described in the Motor Vehicles Act"Eligible Assessee" is one who has NOT MORE THAN TEN TRUCKS. SECTION 44AD FOR ALL BUSINESSES FROM A.Y. 2011-12... IMPORTANT. From Assessment year 2011-12, a new section 44Ad has been inserted inthe Income-tax Act to replaceexisting sec.44AD 744AF. The new Section will be aplicable to any business ( whether it is Retail trade,or Civil construction or any other business). 4. Total Turnover/ Gross Receipt of the Assessee in the previous year should not exceed Rs. 60.00 lakhs. Date of filling of ITR-V extended to 31st July, 2011. The Central Board of Direct Taxes has decided to extend the time limit for filing ITR-V forms relating to income tax returns for A.Y 2010 – 2011 filed electronically on or after 1st April 2010. In the Budget date 28.2.11, the FM annoounced a new category of Individuals above the age of 80. They will be given Tax Exemptions upto Rs.5 Lakhs. My Question is.... Should the people above the age of 80 should be Taxed at all..? I was hoping to put up a Tax Calculator on This Site. Wonder if People are Interested... What do you think? Well its up and working people..!